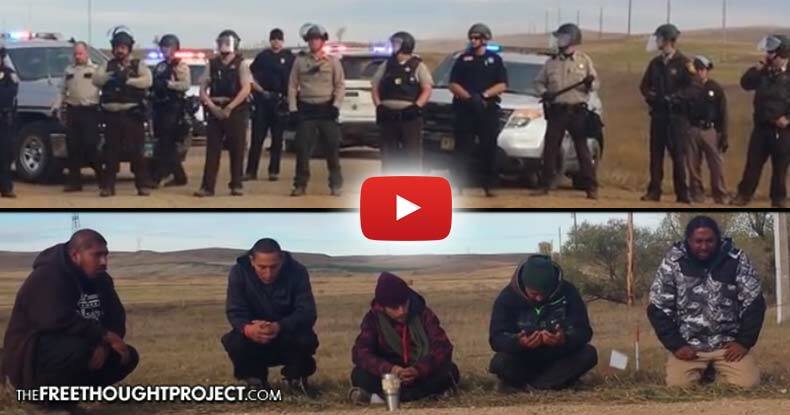 Cannon Ball, ND – Over the past several weeks, the police state has come out in full force as Native Americans fight to protect their water sources from the threat of the Dakota Access Pipeline. Mainstream media remained largely silent as federal, state and local authorities worked on behalf of Energy Transfer Partners to squash dissent. Even prominent journalists found themselves targets of the State, charged with dubious “crimes” such as “inciting a riot” and “conspiracy to theft of services” – for doing nothing more than filming protests and the ensuing violent crackdowns. The First Amendment is no obstacle when it comes to advancing the interests of the corporatocracy. This was put on display again on October 15 when five Native American Water Protectors left a protest near the Standing Rock Sioux Reservation to pray on the shoulder of a public road. In response to this peaceful behavior, 40 cops from at least eight departments in three different states – complete with riot gear, automatic rifles, an armored vehicle and even an LRAD acoustic weapon – swarmed the five praying, unarmed Native Americans. Fortunately, the praying activists were able to leave unharmed by the gang of State agents poised for violence. The militaristic presence is a stark reminder of the modern-day response to the exercising of First Amendment rights. Just as protests in Ferguson and elsewhere against police brutality were met with warlike oppression, Native American protests against threats to their natural resources are treated the same. “Water Protectors are working to stop the completion of the Bakken Dakota Access Pipeline which goes under the Missouri and Mississippi River and over the Ogallala Aquifer. Water Protectors have taken up camp just inside and outside of the Standing Rock Sioux Reservation near Cannon Ball, ND. The Missouri is the reservations primary source of drinking water. Native American protesters have legitimate cause to be concerned for their natural resources, as we previously reported that pipelines have spilled 7 million gallons of crude oil in the U.S. since 2010, with “the annual number of significant accidents on oil and petroleum pipelines” increasing by almost 60 percent. Although pipeline spills are less frequent than spills by truck or train, they have spilled three times as much crude oil over an eight-year period. Even if the Dakota Access Pipeline is completed, the size and intensity of the opposition has certainly been a surprise to the governments and corporations poised to reap massive profits.